Poppies bloom in profusion around our house. 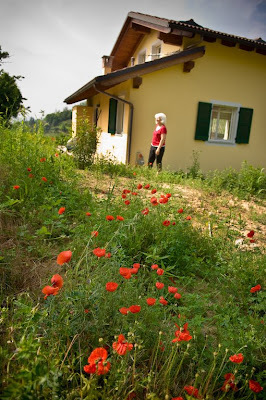 Spring in the Italian Piemonte means wildflowers everywhere including wild orchids, but especially poppies. Magical bright red poppies! Every time I say that word in my head it sounds like ‘Pahhhh-peees’ per The Wicked Witch of the West. 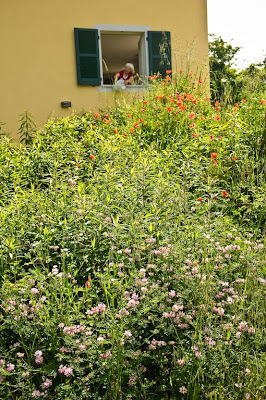 And the poppies are working – I’ve slept like, well, like I was drugged the last 2 nights here. I counted at least 10 other varieties of wildflowers in bloom as well. Except I awoke around midnight last night due to a swarm of fireflys tapping on my window. How lovely! I haven’t seen fireflys like that since before color TVs. Back then in summertime little girls, myself included, ran around bare chested like the boys. Why not? It was hot and many years before I would need a bra, which made it long before I burned one alongside Bella Abzug at an NOW (National Organization of Women) rally in 1971. On long summer nights back then the neighborhood kids used mayonnaise jars to catch fireflys in flight. You had to be quick and open the jar only at the last second so all your other fireflys didn’t escape. We poked holes in the top of the jars with an ice-pick so they wouldn’t die too quickly and then used the jars like flashlights. I think my Italian fireflys last night were attracted to the tiny glowing light coming from my Mac computer. Through the window they could see the little spec of light throbbing to alert me the computer was still on – beaming low then bright, low then bright continually – it must have had a familiar look to them. I believe my Italian fireflys thought the undulating light was some exotic cousin come to town, because on closer inspection I could see they were really hurting themselves trying to get in. Probably male Italian fireflys. Typical!